The Red Wrath is a story of young boy, Asif, eldest of the three children of Zulfiqar Khan, who lives in Afghanistan in 1970’s. In this tale of yearning and nostalgia the protagonist or Asif goes through many ups and downs of life both expected and unexpected that shapes his thinking and fuels his desire. His is one of the most respected families of their village, owing not only to his father’s position as an inspirational leader and political speaker but also because of the contributions made by his grandfather, Masoud Khan for the development of the village. Asif’s world presents a picture of perfect familial happiness, with a loving Hasiba and caring Zulfiqar by his side. His two siblings – Mohammad and Sahar complete the family picture. Asif as he enters his teenage realizes that he secretly harbours love for a girl named Latifa, despite the realization that the love was forbidden on account of cultural beliefs and traditions, especially in the rural heartlands. He wished to set his beloved free from all notions of ‘cruel’ society that failed to understand women or their needs. Though as adolescents Asif and Latifa are unable to marry each other, it is much later in life, that both are united amongst lot of drama and convincing. Asif himself was brought up in a secular and open minded environment by his parents and he wished for the same for everyone else around him. He valued freedom and progress in all walks of life. He loved reading too. Life ran smooth Asif until the day the Communist regime passed an order for his father’s arrest on account of latter’s open critique of the communist ideology. The arrest set into motion a definitive series of events that were to alter the course of Asif and his family’s life. What follows is a tale of unfortunate events that would open the eyes of the readers to the years that Afghanistan lived under the Red Regime. Asif learnt that his father has been murdered in cold blood by the Russians, realizing that the country was not safe for the family; they opt to move out to refugee camp at Peshawar, Pakistan. Asif gets another jolt when he loses his sister in the refugee camp dies due to illness. His mother goes into deep shock after losing both her husband and daughter and becomes disillusioned. Asif shifts to the Peshawar in Pakistan to find a job and support his ailing mother. Working as a daily earner, not only he supports his family but also supports his younger brother’s education. He learns reading and writing at home only with the help of his brother’s books. Only after many years they decide to return to their homeland. He finally returns to his village to start life afresh in the familiar surroundings. But destiny had something else in store for him. Though the Russians’ had left the country but an internal menace named Taliban or religious fighters had taken over the country. Taliban with their forceful and dictatorial ways not only shut down his business but also thrash him badly. Asif finally decides to move to another country for good. Oslo puts him back in contact with one of his long lost best friends, Akram, who becomes instrumental in making Asif revisit the long buried memories of childhood and also sparks in him the desire to get back in touch with his family. With the help of some new found friends in Norway, he re-establishes contact with his brother and ends up with news of his mother’s death, which leaves him completely devastated. He realizes that his search and final discovery of a much settled life (in Norway) had cost him his most near and dear ones. The circumstances lead him into taking an important decision for himself and his family and so he writes a letter to his wife and his remaining family, promising to bring them back to Norway. His journey between the two destinies of sorrow and prosperity transforms him into a much balanced and ‘humane’ being who knew the value of life, peace and harmony and it is this journey which teaches him to forgive even his enemies too. The Red Wrath is widely available all across in more than 26 countries. BCID 072–11419206 – Book Crossings code. Sitting in a coffee shop in Norway’s bustling city of Oslo, Asif was taken aback when his childhood friend Akram suddenly happened to meet him. Nostalgia sets in as Asif goes on a reverse journey back to the times when life did a flip-flop between good and bad, happiness and sadness. A responsible son of a proud and kind father, Asif’s life in a humble village of Afghanistan was more than just ideal. A loving mother, caring father, playful siblings, a trustworthy friend along with the shade and the warmth of the mulberry tree made him a boy that anyone would be jealous of. Things looked good until the communists lead by People’s Democratic Party of Afghanistan (PDPA) overturned the people friendly government after brutally executing the then President Sardar Mohammed Daoud Khan and his family members. Life took a tumultuous and ugly turn as the Red Wrath wrecked havoc in the nation taking the people along its path. Asif would soon see his dear ones getting separated from him in the most painful manner. The death of his father and little sister had Asif stare at his future in horror. But Asif’s determination and his strong will to have a good future for his family and himself takes him to Pakistan and then to Norway where he tries to collect the pieces of his life and bring them back to life. Author Hatef Mokhtar’s The Red Wrath: A Journey Between Two Destinies is a heart-wrenching story of courage, bravery and hope on one end and of brutality, death and darkness on the other. Chief Editor of The Oslo Times, Hatef is definitely a brilliant observer of the little things in life as his comprehensive narration makes the story come alive. A work of class, Hatef lays Afghanistan literally in front of you. Its culture, faith, people and the lovely landscape gives us a virtual glimpse of a land where love and respect are considered supreme. The book is a must for those who know little about Afghanistan and its people and. It’s a story which inspires you to do the unthinkable when life is not so kind. Reading this work is an experience in itself. Certainly a Fiver! The Red Wrath by Hatef Mokhtar is the tale of Asif Khan, a boy born in a village in Afghanistan during the reign of President Sardar Mohammed Daoud Khan in the 1970s. Against the backdrop of his reign, Afghanistan was on its way towards progress; it meant a civil and unified society and the emancipation of women. For Asif, his family and friends, it was a regular idyllic life of the landed gentry in a village. He lived with his parents (Zulfikar and Hasiba) and brother and sister and they were happy and safe. Modernization had not swept into their region and people still relied on horses and carriages and life in terms of infrastructure meant arduous. Mazar-i-Sharif was the closest city they could go to for an outing or a trip if someone was unwell and needed to see a doctor. However life was not meant to be remotely easy for these ordinary folks for long. In Kabul, the political situation was not hunky-dory. In 1978, President Sardar Mohammed Daoud Khan was assassinated by the communists and the People’s Democratic Party of Afghanistan (PDPA) came to power in 1978. Thus began the brutal killings and torturing of intellectuals, religious figures and the elite. Nur Mohammad Taraki became the president. However his reign was interrupted by his assassination and Hafizullah Amin came to power. The Soviets replaced him and Afghanistan fell into an abyss of despair. Asif’s father, Zulfikar was jailed never to return home. He died in police custody and his family never got to know where he was buried. His only flaw was that he did not believe in communism and he stood up to his opponents. Their flight from one village to the other could not save them from the vindictiveness of those in power. They sunk into deep poverty. The lives of Asif, his family and those around him changed for the worse. Amidst the turmoil, their haven of survival seemed to be Peshawar in Pakistan. The life and deaths in the refugee camp took a severe emotional toll on him and his family until they returned to Afghanistan after the Soviets. Afghanistan never remained the same; the Taliban had taken over. There began another reign of terror and fanaticism. Left with no choice, Asif had to flee and seek asylum in Norway. This book is a heart-wrenching read of a country that has been shattered by autocratic rule, zealots, and fanaticism. It throws light on their idea of freedom, love for their community as an entire family, and the plight and role of women in their society. Hatef Mokhtar has raised some thought-provoking questions on widow remarriage and love. The essence of this story lies in the concept of forgiveness; Asif loses his father and sister, loses his innocence working in Peshawar to provide for his mother and brother, he is harassed by the police on the rough lanes of Peshawar and his faith is questioned by the Taliban. Yet he forgives. Secondly, the book reveals a very resilient spirit in Asif despite his fear of human loss, stress and break down. He remains positive or rather moves on and not once does he become bitter filled with hatred and loathing. His love and sacrifice for his family is beautifully described and all through the book, he is a giver. Thirdly, The Red Wrath sheds light on the importance of human rights, individual dignity, the right to education and the freedom of speech. Further the author has chronicled the history of modern Afghanistan in a stark yet riveting way. In the news last week the world watched Muslim extremists burning embassies in the Middle East (after others killed an American ambassador) because of an irreverent depiction of the prophet Mohammed. The film that inspired this response was poorly made and completely ridiculous – in every respect. A thoughtful Muslim would have merely pitied, or prayed for, the misguided person that created this idiotic and inaccurate piece of propaganda. A man like author Hatef Mokhtar, for example, who lived through the absolute horrors of the Red Revolution in his homeland of Afghanistan, and then the atrocities committed by the Taliban against their own countrymen, would certainly not have returned evil for evil (violence in action for violence in ‘art’). Instead, perhaps he would have cried in astonishment for the inhumanity of the ‘human’ race before penning a tale that sets the record straight regarding the true nature of Islam and religious belief in the Middle East. Hatef Mokhtar’s historical novel Red Wrath: A Journey Between Two Destinies tells the touching and tragic story of life in Afghanistan during the Communist Revolution; and under the Taliban reign of terror. It is a story that presents the reader with a stark picture of a previously serene and prosperous culture under foreign and domestic attack. In this panoramic epoch we witness a land that once boasted a rich tradition of religious tolerance and communal values being violently uprooted and turned into a killing field. Written from the perspective of a profound character named Asif Khan, the story begins in Norway, where the expatriated Afghani (now an adult) ruminates over the events that shaped his early life and forced him into exile. Throughout the first few chapters of the novel Asif recounts his experiences as a boy living in his native land. This section of the narrative is imbued with the author’s extreme sense of love for his homeland; as the poetic passages describe an idyllic time in Afghanistan’s history. The author, looking back with longing upon the rich culture that characterized Asif’s youth, writes: “Happiness flowed from heart to heart and home to home binding entire communities into close knit families that lived their lives in grace and peace.” It was a period of Afghanistan’s history that many revere and refer to as “The Golden Age” of that country. Unfortunately this peaceful and picturesque era came to a violent end when the Russian Communists invaded the nation. Upon hearing the news that the respected president, Mohammad Daud Khan, had been assassinated by the Russian regime, Zulfikar (Asif’s father) broke down and wept openly. Considering Asif had never seen his courageous father cry, this shocking reaction struck the boy as being particularly prophetic. A wise man, well-versed in political history and the teachings of Karl Marx, Zulfikar understood that this coup d’état (as the Red army seized control of the Afghani government) could mean only one thing: the end of Afghanistan’s golden age, and the beginning of bloodshed and desolation for the people of his beloved country. Within weeks Zulfikar’s revelation—and worst fears—were realized as the Communists came to the village and abducted Muslim men with political influence in the region. Since Zulfikar was one of these “dangerous dissidents,” he was forced to take his family to northern Afghanistan; where they sought refuge among family and friends. Truly a tragic character, Zulfikar, a man with deep convictions regarding the God-given right of each citizen to express (and educate) themselves according to their own individual conscience, lacked the necessary discretion required to keep his family safe from the Red wrath. After delivering an articulate denunciation of the Communist regime in Afghanistan, and calling his countrymen to fight against this oppressive and unlawful occupation, he was arrested by the authorities and put in prison. It was an event that would lead to unspeakable sorrow and suffering for his family. The remainder of the novel is the story of Asif’s struggle to survive and provide for his family in the face of seemingly impossible odds. Not only the central character of the story, but also the heroic voice of reason, Asif possesses the intelligence and survival instincts of a much older man. Through his innocent yet perceptive eyes the reader is given a personal and artistic vision of this period in Afghanistan’s history. For example, upon returning to his native land after several years of exile in Pakistan, Asif rebukes a couple of corrupt Afghani freedom fighters, saying: “You were not like this before…you people used to help each other and build your nation; then why are you all doing this? You are disrespecting your people, and also the martyrs, by collecting bribes and mistreating women, and children.” Passages like this drip sweetness and radiate light, as our philosophic narrator guides us on a journey through the hellish nightmare of a country under siege from without and within. Forced into exile by a foreign enemy; deprived of family members, who died in the battle for Afghanistan; tortured by the Taliban for his liberal views and ‘subversive’ books; and finally exiled one last time out of fear for his (and his family’s) life – Asif Khan never allows hatred to fill his heart or alter his pure perception of the world. Towards the end of the novel, after suffering all these (and many other) hardships, Asif cries to Allah: “Oh, Lord, what have you done to my people, my country? How could the world be so brutal to the people?” If anything, the severe trials he undergoes throughout the course of his life makes him more empathetic towards the suffering of others; as he comes to appreciate the simplest blessings of God. “I live my life full of hope that it is possible to live in a world of harmony and peace. Love was my strength then—Love is my strength now.” With these words this wonderful novel comes to a close, as the reader is left imagining the good things (or potential heartaches) the future might have in store for our sympathetic narrator. In a time where wars are being fought over religious disputes and fundamentalist fanaticism (by Muslims, Christians, and political factions of every nationality) this book comes as a breath of fresh air. The wisdom that springs from Hatef’s poetic heart reminds one that human life is far too precious to waste on religious feuding or ideological mania. Hatef Mokhtar has not merely crafted a masterful work that presents a reasonable and moderate form of the Islamic faith, but he has also managed to capture a glorious period in Afghanistan’s history. Remembering this promising time in a country with such natural and spiritual potential may indeed inspire those who love this land to take Afghanistan back from the internal and external forces that continue to rip it apart. Let us pray that a generation of men and woman (like our noble narrator) with purity of purpose and vision will rise up and fight oppression and foreign occupation; forsaking the violence and hatred that only leads to death and destruction; finding new power through the language of compassion and an active pursuit of justice and peace for all people. Let us pray that they pick up this breathtaking historical novel and learn from it! Sitting in a coffee shop in Norway’s bustling city of Oslo, Asif was taken aback when his childhood friend Akram suddenly happened to meet him. Nostalgia sets in as Asif goes on a reverse journey back to the times when life did a flip-flop between good and bad, happiness and sadness. A responsible son of a proud and kind father, Asif’s life in a humble village of Afghanistan was more than just ideal. A loving mother, caring father, playful siblings, a trustworthy friend along with the shade and the warmth of the mulberry tree made him a boy that anyone would be jealous of. Things looked good until the communists lead by People’s Democratic Party of Afghanistan (PDPA) overturned the people friendly government after brutally executing the then President Sardar Mohammed Daoud Khan and his family members. Life took a tumultuous and ugly turn as the Red Wrath wrecked havoc in the nation taking the people along its path. Asif would soon see his dear ones getting separated from him in the most painful manner. The death of his father and little sister had Asif stare at his future in horror. But Asif’s determination and his strong will to have a good future for his family and himself takes him to Pakistan and then to Norway where he tries to collect the pieces of his life and bring them back to life. 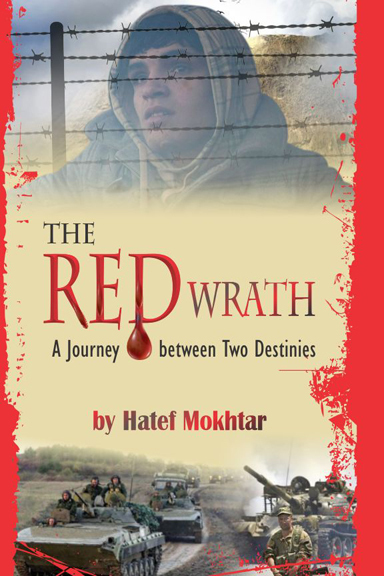 Author Hatef Mokhtar’s The Red Wrath: A Journey Between Two Destinies is a heart-wrenching story of courage, bravery and hope on one end and of brutality, death and darkness on the other. Chief Editor of The Oslo Times, Hatef is definitely a brilliant observer of the little things in life as his comprehensive narration makes the story come alive. A work of class, Hatef lays Afghanistan literally in front of you. Its culture, faith, people and the lovely landscape gives us a virtual glimpse of a land where love and respect are considered supreme. The book is a must for those who know little about Afghanistan and its people and. It’s a story which inspires you to do the unthinkable when life is not so kind. Reading this work is an experience in itself. “The Red Wrath” is a poignant read highlighting the plight of the people of Afghanistan. Despite the oppression of the Communist Regime the people maintained their bravery and courageously sought their independence. The rule of the communist was harsh but the rule of the Taliban was much worse. The people that resisted the loss of independence were considered dissidents and were imprisoned, tortured and put to death. “The Red Wrath” demonstrates the rich and colorful culture of the Afghans. The women were oppressed by society; they lived under the strict rule of their father until marriage at which time they became the property of their husband. The characters in this tale are fictional but realistic. Their actions demonstrate their strong will and desire for self-rule. In “The Red Wrath” we meet Asif and follow his journey from childhood to adulthood. He witnessed the takeover by the Communist Regime and the Taliban. He experienced the loss of his soul mate early in life. Although his mother attempted to force him into a loveless marriage Asif resisted. After his father’s arrest for protesting the communist takeover, Asif took a change of clothes to his father but was denied access to him. On his final visit he discovered that his father had been executed. “The Red Wrath” was written by Hatef Mokhtar. I found it impossible to put this book down once I began reading. I was quickly caught up in Asif’s life. Mokhtar is a master at bringing his characters to life. Many books have a strong plot or strong characters but this book is unique in that it has both strong, well-developed characters and an amazing plot. Asif lives in Oslo maintaining a flat subsidized by the government and working hard at unskilled labor every day. He meets, by chance, his old friend Akram from his village in Afghanistan. Being with Akram and his family, Asif remembers and writes. Before the Communist coup of 1979, that brought in thousands of Soviet troops, the village of Shir Abad was a place where Uzbeks, Pushtoons, Hazaras, and Tajiks lived as neighbors in Muslim peace and mutual support. Asif and his friends and neighbors, both boys and girls, attended school. On Saturdays they studied the Quran with the Imaam. Children grew and played and learned and lived in families that honored one another. Everyone, no matter from which caste, tribe, creed, race, color or gender, was always welcomed with open arms. But war and politics, the two carcinogenic ailments, changed everything. Asif’s family lived not only by the Muslim Quran, but also by the ancient Pashtoon law passed orally from father to son. He experienced his first separations at the age of 13 when the Noor (light) of his heart, his hummingbird, was married to a man old enough to be her grandfather. Her stepmother, a divorcee from another village, created this handiwork. Latifa’s purity of heart, soul, and body brought a high bride price from this rich man Qalandar. Asif knew it was something Latifa’s own mother, who was like his aunt, would never have allowed. Latifa, the child scholar, moved out of his life overnight to another village where she was stepmother to children older than she. Then Asif’s father, Zulfikar Khan, stood in the mosque and spoke against the new regime. His father moved his family that night to another village. Then came the tanks. Zulfikar was taken away and was never seen again. The village was bombed. Men with machine guns killed men, women, and children indiscriminately. Suddenly Asif was responsible for the safety and welfare of his family. Separated from his father, he now became separated from his village and friends as he took his mother and younger brother and sister across the mountains to the refugee camps in Pakistan. He struggled to earn enough to provide shelter, food, and education for his brother. Born in Afghanistan, Hatef Mokhtar, grew up in a refugee camp in Pakistan and is now the Editor in Chief of the Oslo Times. More intense than either “The Kite Runner” or “A Thousand Splendid Suns” by Khaled Hosseini, Mokhtar’s historical novel describes the sad history of the last thirty years of Afghanistan. This is a book that is written with tears and I hope that the reader will read it the same way. This is not casual reading material. The reader will be researching for the whole story, but will actually get it all here, deeper than the facts. The use of passive voice is inconvenient at first, but becomes necessary to maintain some emotional distance from Asif’s pain and anguish. Asif sat enjoying his favorite stress reliever, a cup of coffee. Perhaps it was fate that brought his old friend Akram Khan into the same café. Asif spent years trying to locate Akram only to discover that they had been living in the same city for years. The reunion brought back memories of their childhood in Afghanistan. He recalled the time when he broke his leg. The pleasant memory of Latifa, his Hummingbird, waffled through his mind. She had been promised to another, a man addicted to cocaine, 45 years her senior and abusive. Although Latifa deeply loved Asif, her fate was out of her hands and out of the hands of Asif. His thoughts moved forward to the time his land was invaded by the Russians. Their rule was brutal and cruel. Asif and his family fled their home. Zulfikar, Asif’s father, bravely stood up to the Communist Regime when he spoke at the Mosque. It led to his arrest and the need for young Asif to seek a way to support the family. When the Taliban came to power they proved to be just as cruel if not more so. “The Red Wrath” by Hatef Mokhtar is a love story set in a historical background. I found the cultural information fascinating. I had never heard of Pashtunwali. “The code was a set of unwritten laws of the Pashtun people, which had existed for over five thousand years. It was this ancient code of honor that Pashtuns of Afghanistan and Pakistan followed much before the arrival of Islam.” I also did not know that “Buzkashi was their national sport, played on horseback.” Mokhtar’s description of the wedding ceremony was beautiful and yet left me sad. The author captured Asif’s love of his home land and his anger at the Communist Regime. The effect this tale’s characters will have on the reader is what makes this book special. I truly cared for Asif and his family. I must admit that I have a different perspective of the Afghans after reading this book. They have a great sense of honor and respect. Their culture is rich and their history often tragic. Hatef Mokhtar has brought both his characters and his country to life on the pages of “The Red Wrath”. Asif is an Afghan refugee living in Oslo, Norway. He meets a childhood friend, Akram Khan, who now lives in Oslo with his wife and children. As boys, Asif and Akram lived in Shir Abad, a town in the province of Balkhin in northern Afghanistan. Their town was a beautiful place with “close-knit families that lived their lives in grace and peace”. Asif’s mother, Hasiba, and his remarkable father, Zulfikar, love each other and their three children, Asif, Mohammad, and Sahar dearly. Asif falls in love with next door neighbor, Latifa, but as was the custom, she is married to a man forty-five years her senior. As was tradition, beatings of schoolchildren and pressuring them to learn occurred when Asif, Akra and Latifa were in school. This eventually forced some children to promote orthodoxies that did not define basic human rights. But while there traditions were observed, in those pre-Soviet days in Afghanistan, everyone from every caste was welcomed and supported. Then in 1978, Soviet Russia invades and takes over Afghanistan and Asif’s family flees to the big city of Pol-e-Khomri, changing their lives forever. “The Red Wrath” is a brilliant and highly informative story about Afghanistan before, during, and after the time when the Soviets invaded. Author Mokhtar’s characters of Asif, his family and neighbors are spectacularly developed and carry the author’s story well. The plot line unfolds to the final pages. “The Red Wrath” is a first-rate read! Hatef Mokhtar is the author of The Red Wrath, a book that is a reflection of the changing and volatile political climate of Afghanistan since the 1970s. In this exclusive interview with BookChums, the writer and activist discusses the title and essence of the book, its genres, its audience, and the relevance of storytelling. Thank you for the interview with Book Chums. Is the story of Asif in “The Red Wrath” an autobiographical account? First of all; I would like to thank you for providing me with an exclusive opportunity for bringing out the message of this book, which I have tried to spread through my writings. No, it’s not an autobiographical tale, but is fiction which has been written on the basis of experience, reality and facts…all of which have remained untold and unheard by the outside world. It is a ‘historical fiction’ book, which has tried to shed light on the struggle of Afghan society and the families who lost their dear ones, got separated in the Soviet invasion of Afghanistan and in its aftermath and it is also a story which reveals in lucid detail the angst and turmoil experienced through feelings of separation and sacrifice — which the people in Afghanistan made and which they have been living all along even to the present time. The book also elucidates and exposes the stark contrast between what is told and that which remains untold. What does the title “The Red Wrath”, signify? “The Red Wrath” signifies the red army of the USSR (the Union of Social Soviet Republic) that invaded Afghanistan in 1979. It also signifies the bloodshed of millions of Afghan civilians who were killed and those who were displaced from their homes. Red denotes the color of Communism, Wrath signifies the atrocities or sufferings borne by the people in the country during the last 30 years and more. Red also highlights the pangs of inner pain and anguish of the soul which is felt as an effect of love and its related joys and sorrows. The symbolism of Red is multifold and multi-dimensional in its meanings and implications. What challenges did you face while writing this book? Did you develop a synopsis before writing the book? Every writer, whenever he tries to pen the strings of magical words, finds the complexities of the storytelling welcoming his world of thoughts. Every story comes with its own set of challenges. Thus, when I prepared myself to relate my experiences and the tales of my homeland, to add to the knowledge of this ever changing world, I too underwent a similar inner sublimation of soul substantiated all the more by poise and harmony between thoughts and expression. The main challenge which I faced was about highlighting and explaining the crimes and hatred spread by Communism in this part of the world, which used to be the most peaceful and hospitable of societies, nurturing age old traditions of equality and justice, love and amity among the various factions inhabiting the land for centuries. Your take on widow remarriage stands out as stark yet subtle in the book? Are there many like you who think this way in the contemporary Afghan society? No, there are not many people there who think in the same manner as I have tried to explain and put it across — as a practice to be considered, as an example where the unwanted social customs denying this favor to widowed women, or the discriminating attitude of the male dominated world, had resulted in the demise of the practical yet almost ideal woman in the society I have written about. Let me point it out very clearly here and with added emphasis that women, like men, must have equal rights in reality and not just in words and paper. If a widowed man can remarry then why can’t a widowed woman remarry? Why the discrimination? Why the unjust attitudes and superstitious postures which have no logical basis and which defame the moral worth of the female gender? I believe in truth and justice, honesty and fairness, equality and social emancipation and I defy superstitious malpractices no matter where they happen to take root or stem from. So is the approach in my book. No law or religion deprives a widowed woman from marrying again. Nature is against unjust discrimination between genders. So why follow superstition and why not return to the path of enlightenment and social awakening which can lead to a much better system of mutual harmony and co-existence between man and woman? I think I have replied logically and with balanced stress to your question. Furthermore, let me add here that my book gives importance to friendship, love and all the good moral ethics and virtues of humanity. Seen in this light too there is only added justification to my viewpoint which believes that women, no matter which society they belong to and in which part of the world they happen to be, should have the same rights as men and if widowed men have a right to marry again so should widowed women too. Did you have any particular kind of audience in mind for this book? This book caters to a wide audience as it can be fitted into two genres: Historical Fiction & War Romance. It also provides ample space for the interests of a youth and at the same time it attracts those who are in search of an emotional fiction-based story, based on real-life experiences; while retaining the grip of timeline which flows as the nature of story takes its cause further… into the darkness and depths of one’s struggle capturing the interest of all those readers who love to read historical fiction. This story basically draws the instinctive interest of almost every reader possible as it provides experiences from every corner of the novel genre. Have you faced any antagonism after the release of this book? The world of storytelling has always been praised and has at times even been criticized for the literary contributions. Since this story has raised many questions on the functioning of the society and the world of imperial politics that have remained divided wide and large, it brings out the world of criticism to you… but I find myself a fortunate person who finds that even after writing such ‘exposing fiction’, I have remained unscathed and clear from heavy criticism. I have been criticized but minimally and marginally by some readers and reviewers. But it’s a part and parcel of the profession. When someone strives to bring to the forefront, untold tales of the world, that have remained conservative and uncovered throughout most of its history, then one must be ready to embrace both praise and criticism. I welcome constructive criticism like every good writer/author all over the literary world does. Praise is good but it is constructive criticism which makes the writer/author grow wiser and enriches his/hers vistas of experience all the more. Are you working on any other book at the moment? Being a passionate writer, I am constantly on the move to get the realities of the dark side of life and living and exposing the same in an honest and humble yet noble and lofty effort to bring more light to this world. As a writer from a war-afflicted nation and as a human rights activist, do you feel that there is hope for peace, through the medium of story-telling? Yes, I do believe and have complete faith that in today’s world of globalization, where human society is witnessing constant series of visible and invisible changes in their day to day life and our life pattern still follows the lines of the quill where the ink is still trustworthy and gives them the true picture about everything, be it fact or be it fiction. It is also an undeniable fact, to which you will also agree with me, that conflict and struggle, turmoil and strife, love and hate, forgiveness, mercy and vindictiveness, war and peace, peace living and brotherly co-existence and enmity and envy have always remained puzzling and unresolved problematic issues of the world we live in, from time immemorial to the present times. However, it does not mean – and I for one will never subscribe to the notion – that one should not struggle for making our land and environs better in every sense of the word. I believe in human values and peace, friendship, love based on mutual respect of each other’s rights, freedom, liberty, fraternity, equality, justice, honesty, chastity, virtues and superstition-free people. Thus, it will be my constant and undying endeavor, to achieve all that I believe in. After all, being a journalist, a human rights activist, a man who respects the other man and woman, as well as being a writer and author of “The Red Wrath”, I have so much I have to offer to the world at large. As Longfellow, the American intellectual poet and writer says: “Art is long and time is fleeting…” so I too have to keep this in mind and do as much of good I possibly can via my writings to be recognized and remembered as an active and honest, sincere and well intentioned man who did as much as he could to make this world a better place than it was. Storytelling has always remained and with the changing times has become more effective and laudable means to spread the awareness of one’s record. And as per my experiences it is still the most powerful and effective tool of freedom of speech / expression which left its long-lasting effect on the memories of a reader. How would you describe The Red Wrath to someone who has not yet read it? The story of “The Red Wrath” is of one a kind. It makes its own way into the heart of the reader. But I must say that if people really care about humanity and want to experience glimpses of devastated lives — of those teeming millions of innocent men, women and children, young and old alike, who suffered barbarism in all its modern forms including mind control torture and who made tremendous sacrifices; and also of those who are still living separated and of those leaders upon whom the public looks as inspirational ones, whereas in contrast their nefarious despotism and lust for power has ruined the lives of millions of innocents and their generations to come, then “The Red Wrath” does fair justice to all these in its chapters, from the first to the last. This story is also about those millions, who have lost or forgotten their real destiny and also about those who have lost their vision to live in peace. The book is also aimed at those those who look for emotional insight into love and in facing sacrificing situations…it’s a must read for all such men and women. The rest is, as I have said before, every story has its own destiny and this story too has its own fate — its respect and its levels of attainment. And the day is not far when the people will find themselves being very deeply and emotionally attached to it and attracted towards its viewpoints on separation and sorrow as my work keeps ingraining itself and making its way between “two destinies“ — as its subtitle signifies – which also happens to constitute the total remained of its wider conceptual meaning.